Instead of hiding from doubt, Willard offers a better way: “[It’s] so important that our fellowship be open and that people, especially young people, feel encouraged to admit and talk about their doubts; they are a good thing to talk about.” This is Willard at his best. Doubt need not be a threat. Instead, doubt can be a doorway to Christian community. Another important contribution is Willard’s deeply held conviction that the greatest apologetic is one’s life. “The ultimate apologetic—that is to say, the ultimate lifter of doubt—is the believer acting in faith in an interactive life with God,” he observes. “That’s it. People need to see individuals living in daily interaction with the kingdom of the heavens.” When the life of Jesus flows within us, people will be drawn to us, curious to discover what’s different about us. Successful Christian apologetics isn’t just facts; it’s an embodied message. When we live out what we proclaim, people will listen. This is quintessential Willard. [If] we are seeking to do apologetics in the manner of Jesus, what is not fitting is for apologists to engage in debates and arguments with an antagonizing, arrogant spirit. Indeed, the best way to make the intellectual aspects of apologetics more effective is to combine them with a gentle spirit and kind presentation. “I’ve never seen a person helped by being belittled,” he proceeds to observe. Instead, the goal of apologetics is to be helpful in a kind manner. Apologetics ought to assist men and women to believe in Jesus and enable them to more fully follow him. This spirit of helpful gentleness is the hallmark of this book. What a refreshing gift. How much good would be done if church leaders took Willard seriously? I wonder what would happen in our conversations, discussions, and debates with those on the “other side” if we sought to assert the truth with gentleness, love, and a good dose of humility. This is what Willard wants us to know: we can actually stand for the truth while loving our opponents in the process. This is a corrective Willard offers the church; we would do well to listen. There are two areas of concern with the book. The first is his discussion about hell. “The only reason there is a hell is because God makes provision for what people want,” he writes, “and hell is simply the best God can do for some people.” He doesn’t deal with the biblical reality of God’s judgment or how sin will eternally separate a person from God’s presence. If you follow Willard’s ideas about hell to their conclusions, it seems possible a person in hell could be released if she decided she wanted to be with God. I wish Willard had explicitly spelled out how sin brings eternal judgment and how the cross of Christ is our only hope for salvation from God’s wrath. The other area of concern is on the issue of the Bible itself. Willard seems to affirm the inerrancy of the Scriptures: “My belief is that as God gave the Scriptures, in their original form, they were absolutely perfect.” Then he qualifies his statement: “But I don’t know of any scholar, no matter how conservative, who would point to a particular version of the Bible in any language and say, ‘That one is inerrant.’” And then he seeks to provoke the reader: “To be a biblical Christian is not to have high views about the Bible. It is to seek and know and live the life that is depicted in the Bible.” This whole section is unnecessarily provocative, and he’s unclear about the nature of the translations we have today. Willard tells us modern translations are “reliable” but doesn’t tell us why. Are they inspired and inerrant? If not, what do they lack? Answers to these questions are vital for a Christian apologetic. We must have a high view of Scriptures and we must seek to live the life Jesus offers. We don’t need to choose between the two. This is the weakest section in the book. Even in the areas of disagreement, I still gain valuable insight. Willard isn’t afraid to humbly think through things and, at the same moment, invite us to do the same. For him the goal is not to win an argument but to discover what’s true about God and the world. As he would often remark, “I am sure I am wrong about some of these things.” He probably is. But he’s right about many things, and he’s a good guide for those of us who want to do apologetics the way Jesus intended. 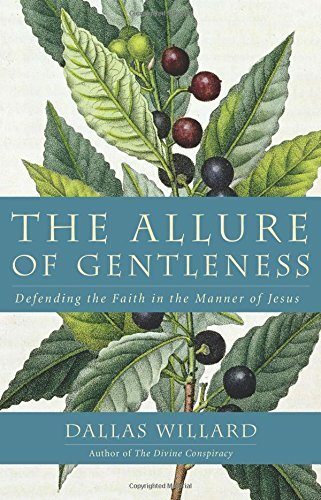 In The Allure of Gentleness we’re reminded we can tackle the most challenging issues of our time with gentleness and confidence. We can stand for what is right without anger or a need to win. You may not agree with everything Willard says, but you will find that his vision for Christian apologetics is compelling.